We have always wanted to do a safari in Africa. On our amazing cruise adventure, we would only have a chance to taste test many of the ports we stopped at. But whenever there was a chance to see big animals on an excursion, that was the excursion we picked for the day. We had seen the first 2 of the Big Five on a game drive in Kenya. 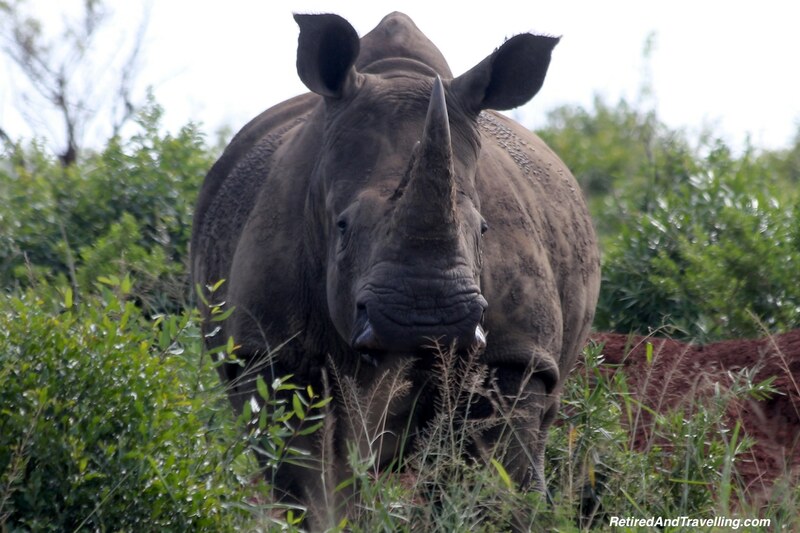 On our second safari excursion in Richards Bay, South Africa we added 2 more to our list. 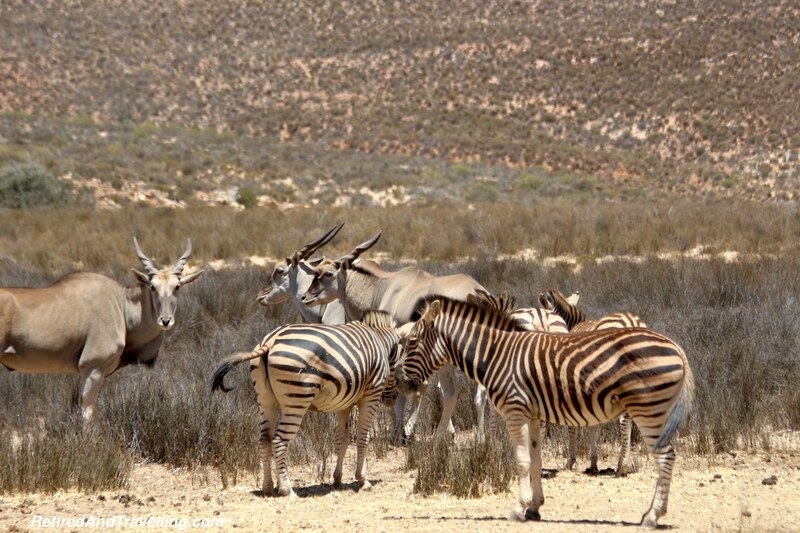 Our final excursion for a game drive from Cape Town would give us a final chance to see animals in the wild. We left the hotel at 7:30 for the Aquila Game Reserve. This was the earliest we had headed out for a game drive but we were still not going to get an early morning game experience. It would be the last of our cruise ship excursions and the last bus trip we would do. We hoped to go out on a high note! 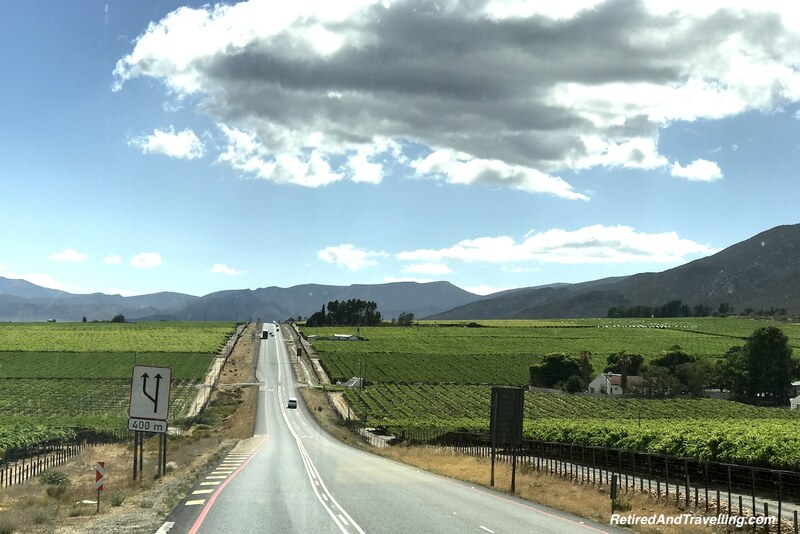 Leaving Cape Town, our early path re-traced much of the route we had travelled for our wine tour of the Stellenbosch region. Our guide Rod managed to find new tidbits of local knowledge to keep us engaged. 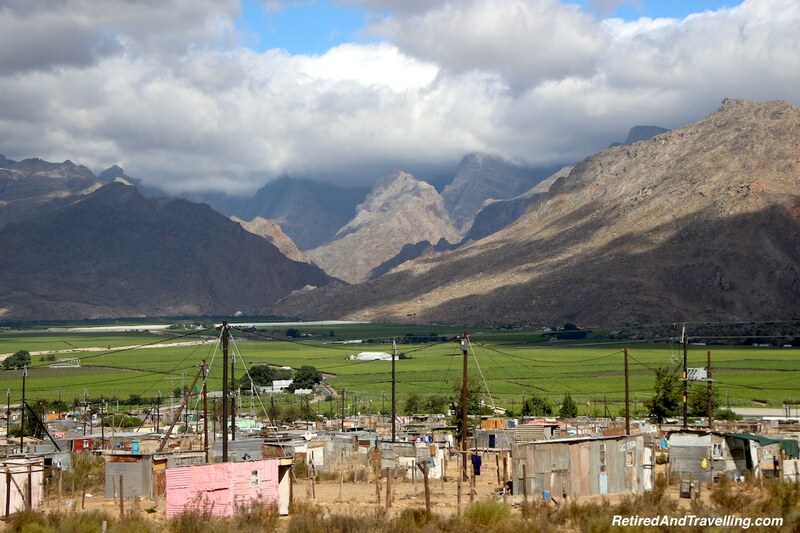 When we passed by the Paarl area, we were into new territory. 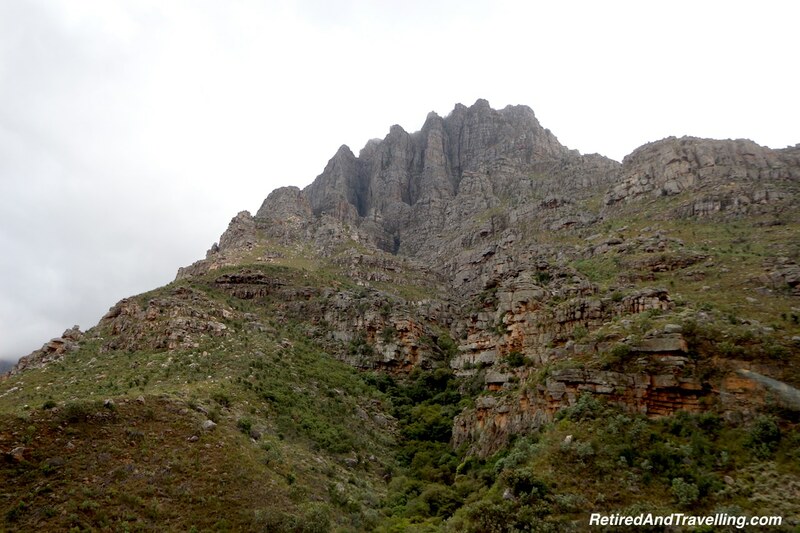 We continued towards the mountains, aiming for the Hugenot Tunnel that would take us through the Du Toitskloof Mountains that separate Paarl from Worcester. 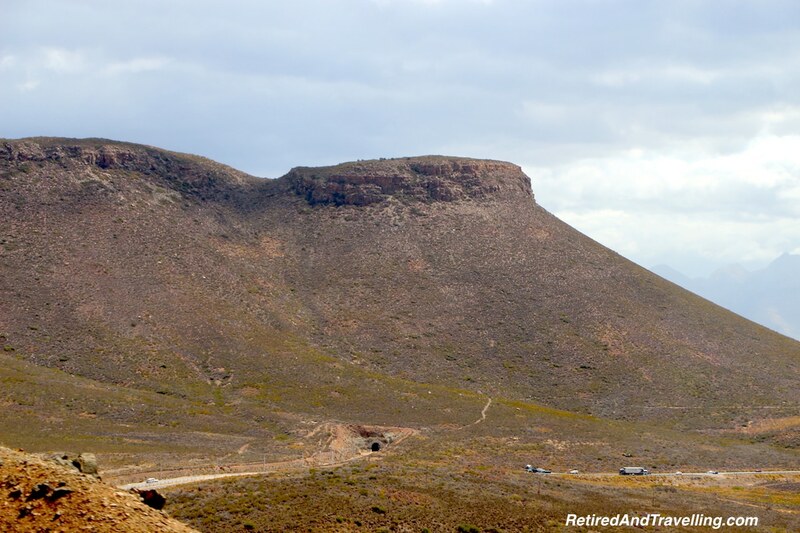 If you don’t want the fast way past the mountains, you can still take the old Du Toitskloof Pass travelling over the mountain. The mountains and valleys we passed were stunning as the sun and shadows played on them. 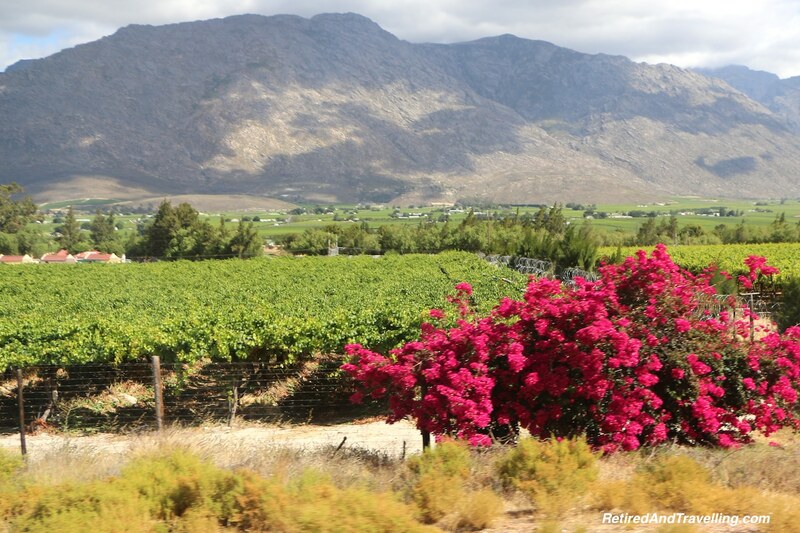 The land levelled off on the flat plateau of vineyards of Worcester and Rawsonville. 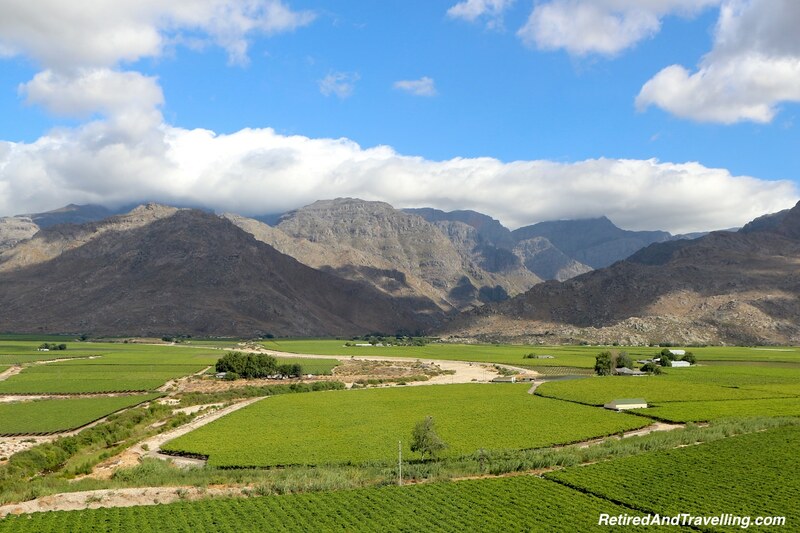 The grape vines in this area are used mostly for table grapes. They spread out everywhere on the horizon. 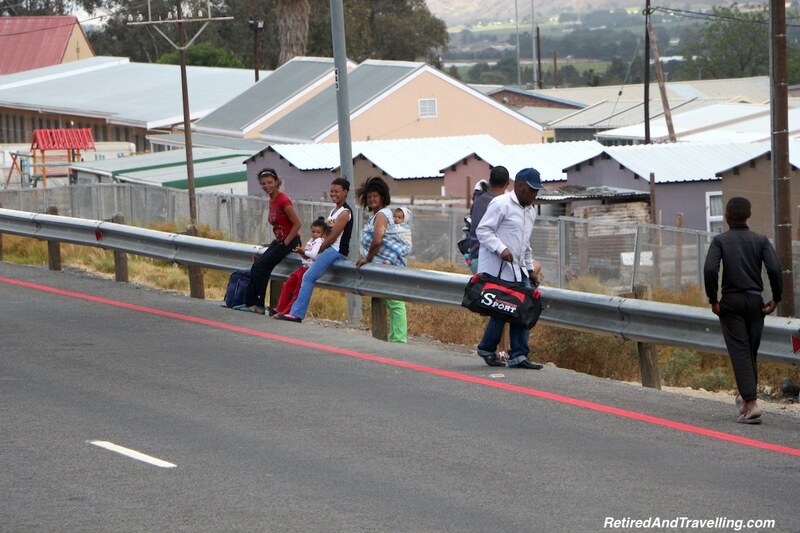 It was a Friday and the migrant workers who picked the grapes were finishing up work for the week. People went home to the huge housing developments close to the fields. Even though there were road signs everywhere for “no hitchhiking”, we found lots of people looking for rides. It took us about 2.5 hours to travel to a game drive from Cape Town. We left the city, went through the verdant valley and entered more desert-like lands. Arriving at the fenced reserve, we were excited to see what wild animals we would encounter on this trip. 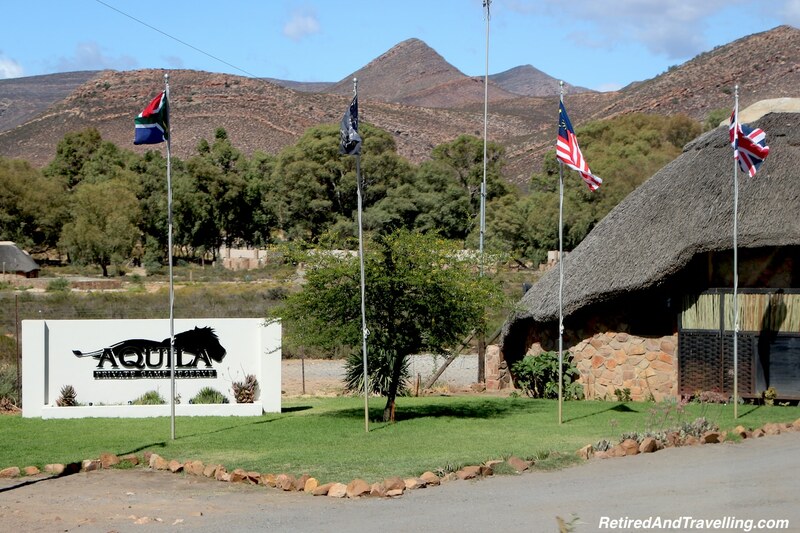 We arrived at the Aquila Game Reserve for our game drive from Cape Town. The bus stopped beside the covered jeeps we would use to tour the park. We started our day with a very civilized drink of champagne. When we stopped in the park for a break, we would again toast our day with champagne. 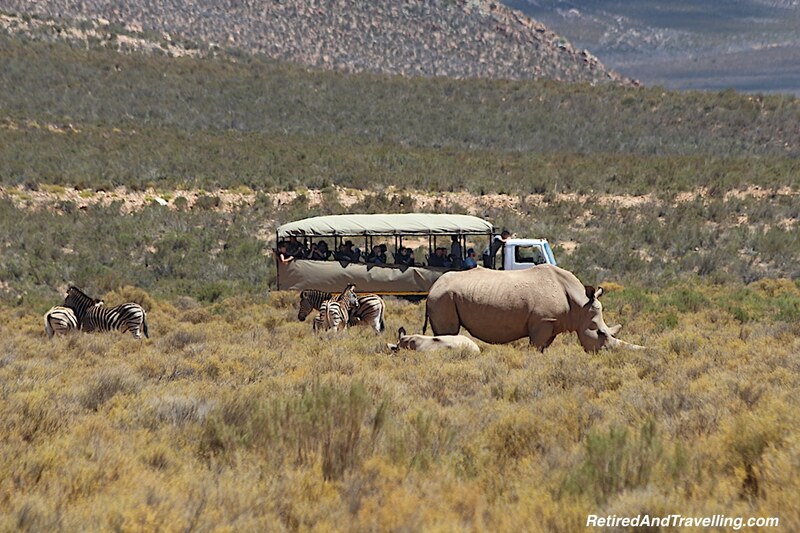 There is certainly an advantage to doing game drive from Cape Town. Wine country was not far away! 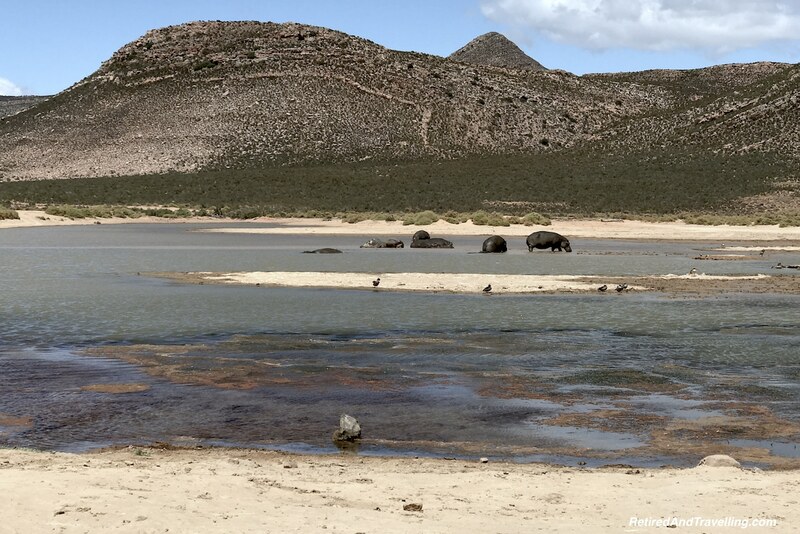 The property included a small hotel for guests who came for a longer game drive from Cape Town. There were also small cabins inside the gate for people who wanted to be a bit closer to the animals. 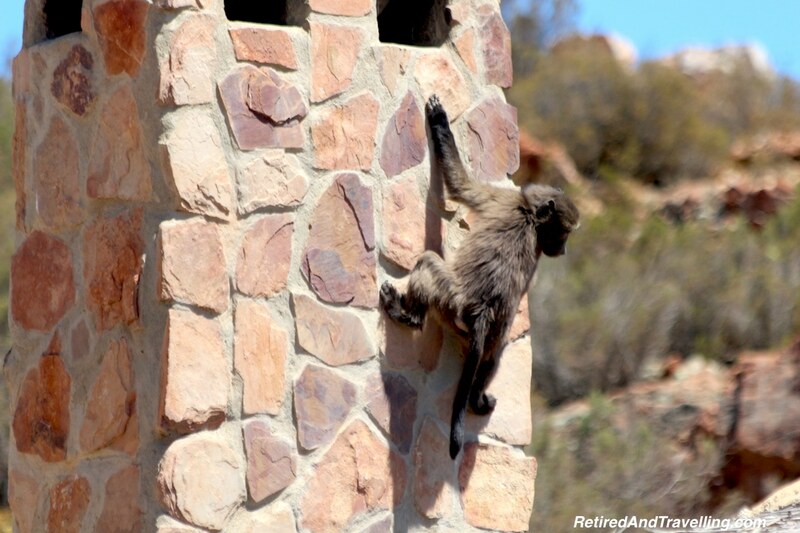 Small fencing protected the cabins from most animals getting too close but the baboons were making themselves at home close by. After our game drive we returned to the main building for lunch. I am sure the people who paid for a vacation at the park were not real pleased as 3 busloads of tourist filled the dining room. The buffet lunch we were served was good and plentiful. We went through the rolling gate and almost immediately our guide stopped the jeep. He pointed in the trees and finally we could make out a Cape Buffalo hiding and then walking away. We were often surprised at what the guide could find as we drove. Our glimpses of Rhinos were equally as disappointing. We saw them only far off at a distance or hidden in the brush. 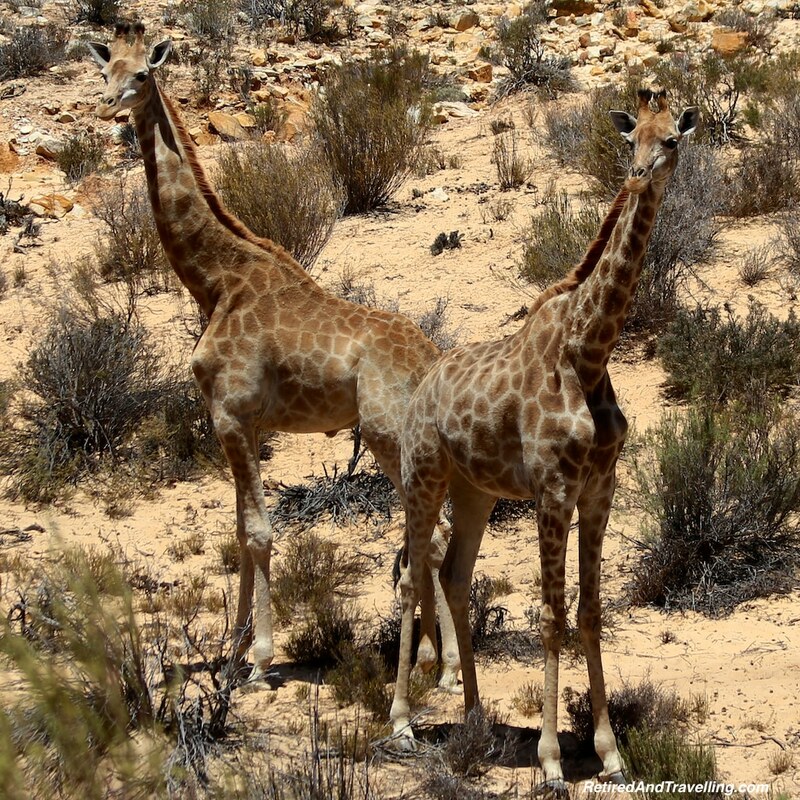 Since we had seen both of these close up on our last game drive, we were happy to move on. When we got close to the more hilly area we saw another jeep stopped ahead. We pulled up close and could see two large elephants walking down the hill. Everyone got pictures but little did we know that the elephants would keep walking. They walked closer and closer. The pair stopped and seemed to look at us. And then they turned and started to walk away. We were just about to move on when they decided to come back for a closer look at us. It was quite exciting to be so close to such large animals. We had seen slightly smaller elephants walking by our jeep in Kenya. But this guide turned the jeep facing out. He was prepared to move out if the elephants got too close. We drove into another enclosed area to see the lions. 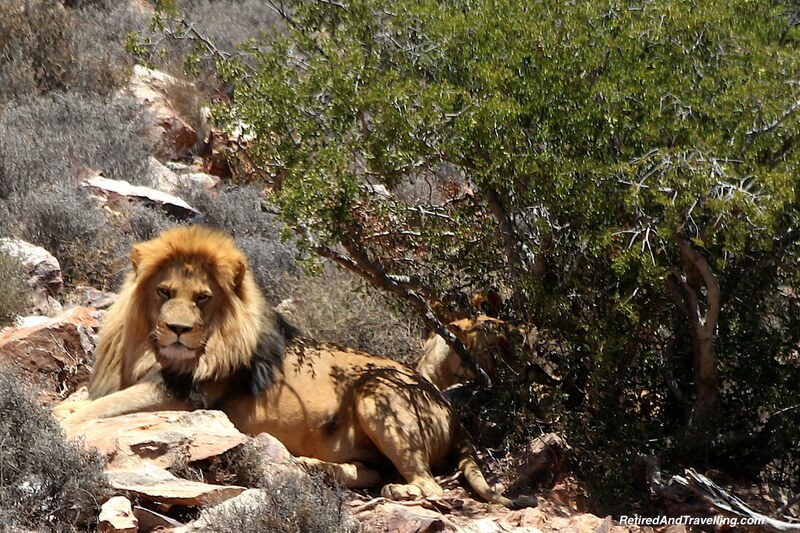 There was a small number of lions on the property that had been rescued and were being raised. It was high noon and the lions could be seen far up the hill under the trees. Luckily David had his good zoom lens and was able to capture a few images even at a distance. 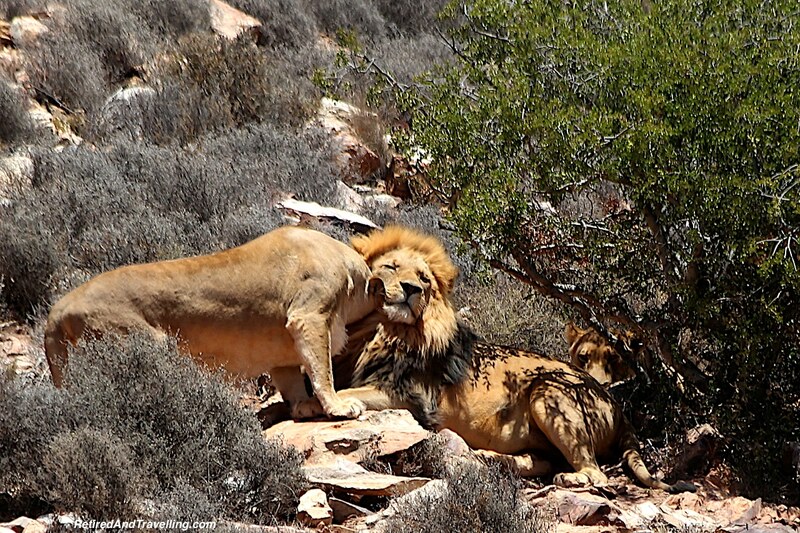 Just when we were ready to leave, a female lion crossed right behind our jeeps! 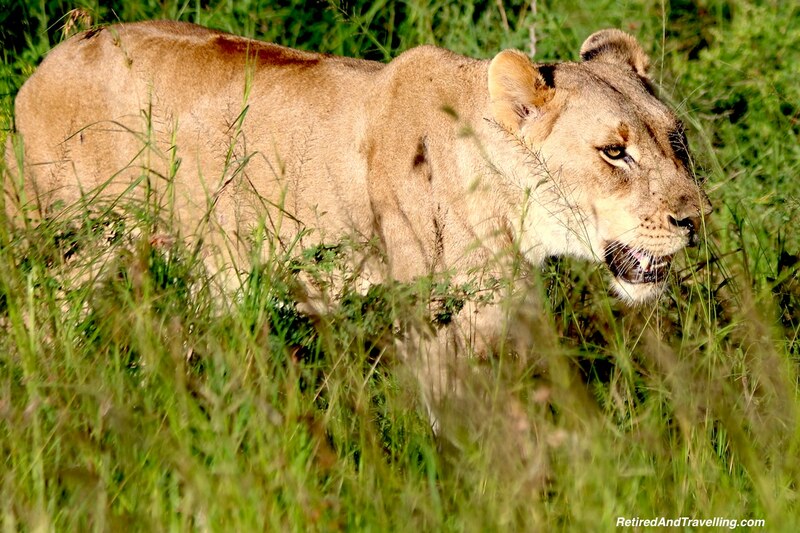 We watched as she stalked up through the tall grass to join the other group of lions. The last of the Big Five was the leopard. 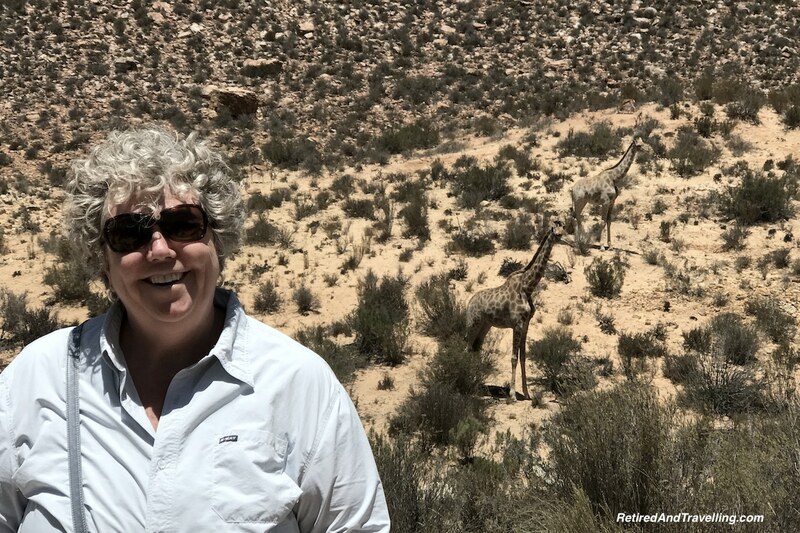 While the guide said that there were leopards on the reserve, they are night predators and we were not going to add them to our list on this game drive from Cape Town. 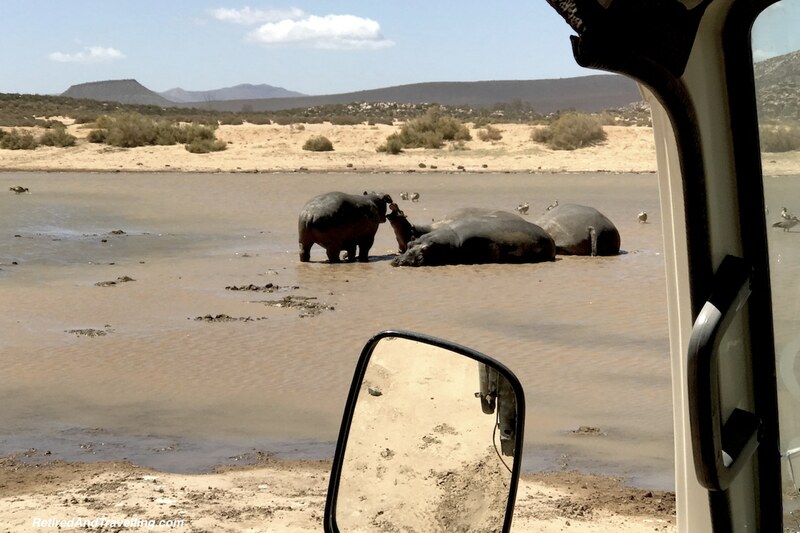 One of our earliest stops on our game drive from Cape Town was at a large water hole. When we first arrived, we could see nothing but water. 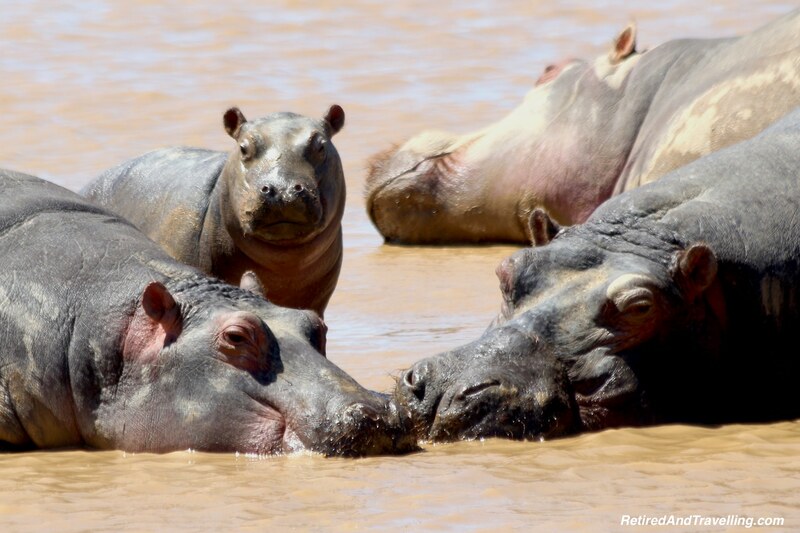 But since Hippos can only stay under for 5 minutes, in no time at all we saw one after another head pop up. As our guide moved the jeep closer, the group got larger and more of the bodies emerged. We watched the Hippos cover themselves with water, wrestle for spots and play with the youngsters. On our first game drive in Kenya we had seen both zebras and giraffes far off in the distance. I was hoping to get closer on this trip. Most of the game reserve was quite desert-like and there were not a lot of high trees. So I did not hold out much hope for giraffes. So when we came across a group of 3 giraffes we were all excited. They were initially far off in the field and the guides even let us get out of the jeep to get closer. When we came back through the same spot, the 3 giraffes were closer to the road. Everyone scrambled again out of the jeeps to get even closer. The guides kept an eye to make sure we did not get too close! Our first view of zebras was far off in the field with the hippo. 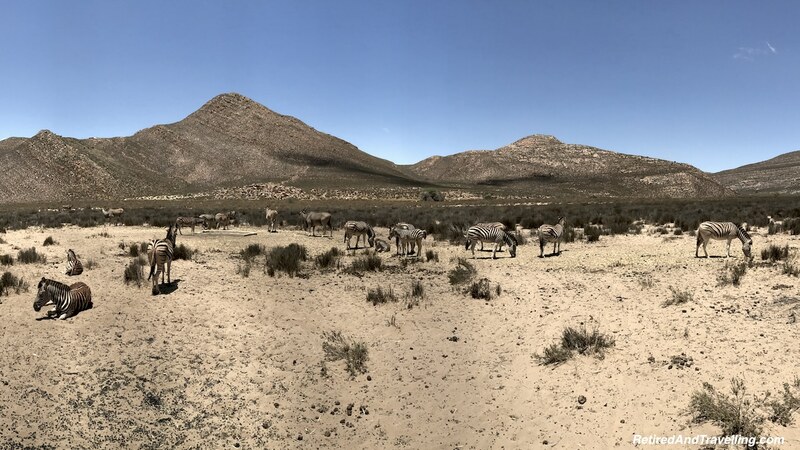 When we entered a new part of the park we came across a large group of zebra at the watering hole with the elands. We just stopped the jeeps and sat there as the zebras and elands walked around us. It was an amazing sight. 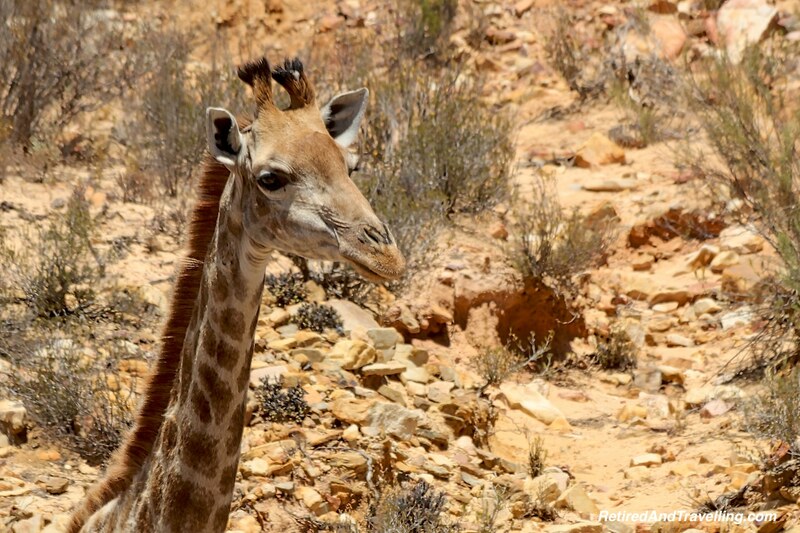 On our game drive from Cape Town our animal sightings were not yet finished! 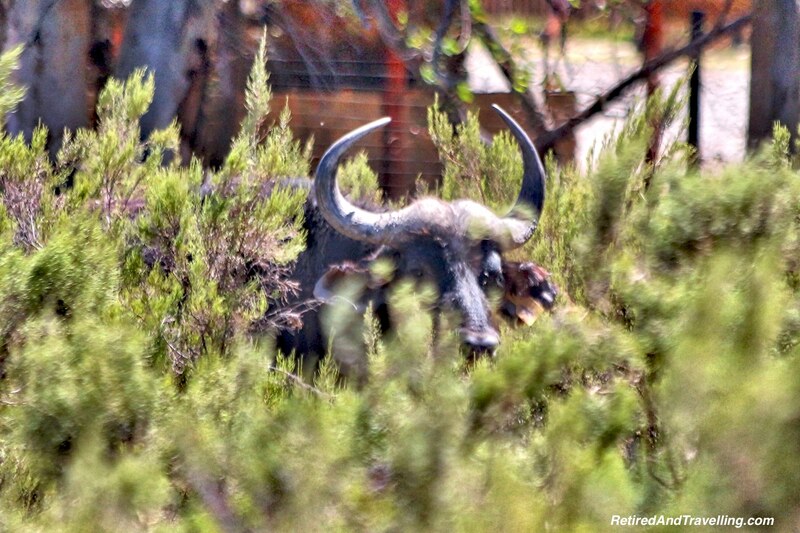 We had seen a gnu (or wildebeast) when we visited the game reserve in Kenya. A couple of times we saw animals out in the grass and yelled for our driver to stop. Sometimes it was just a rock. And one time it was a gnu peeking at us. When we stopped to see the zebras, someone pointed us in the other direction. And there was a gnu close up. 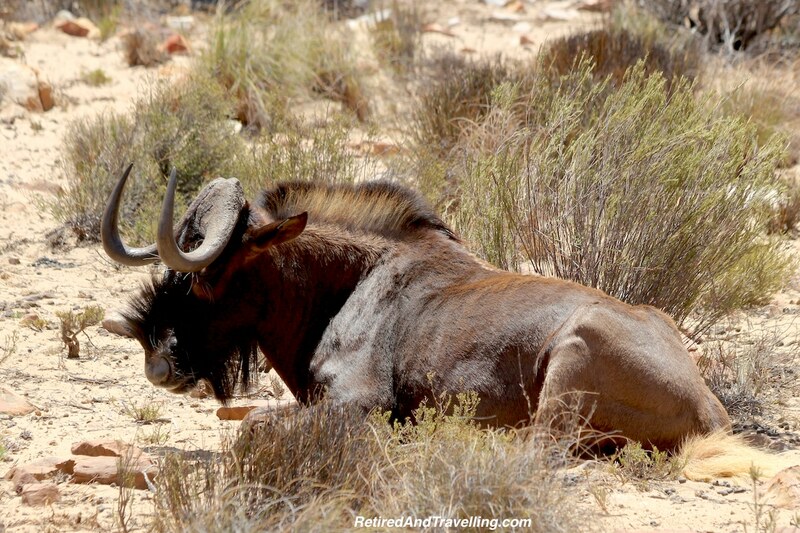 Our driver said the gnu was also called “Spare Parts” as he seems to be composed of some many other animals – the forequarters resembled an ox, the hindquarters an antelope and the mane and tail a horse. 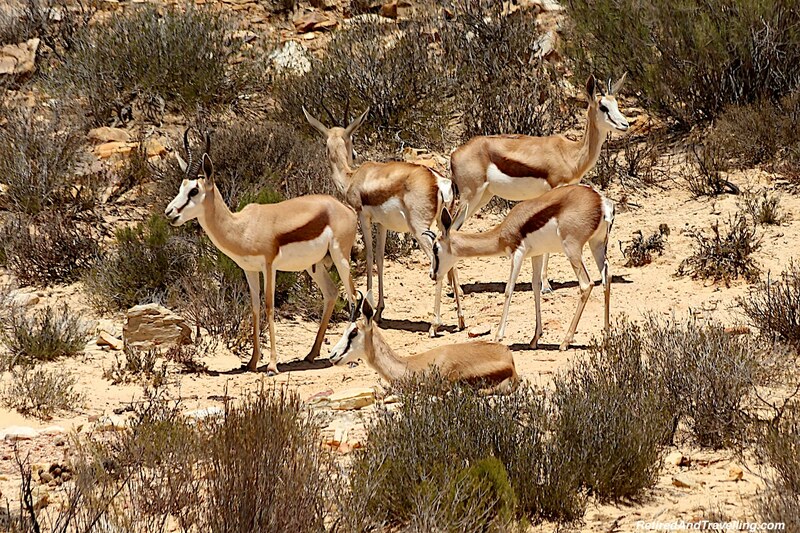 Several times we saw large groups of Springbok antelope far out in the field. 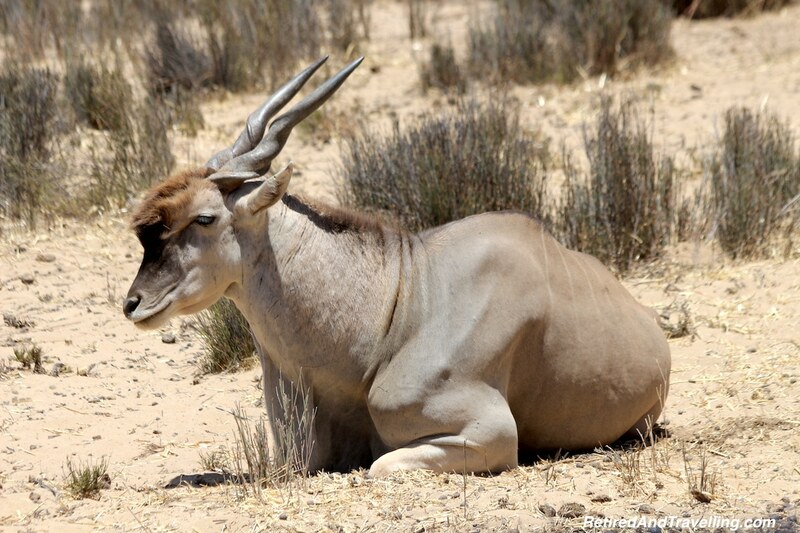 These are the national animal of South Africa. 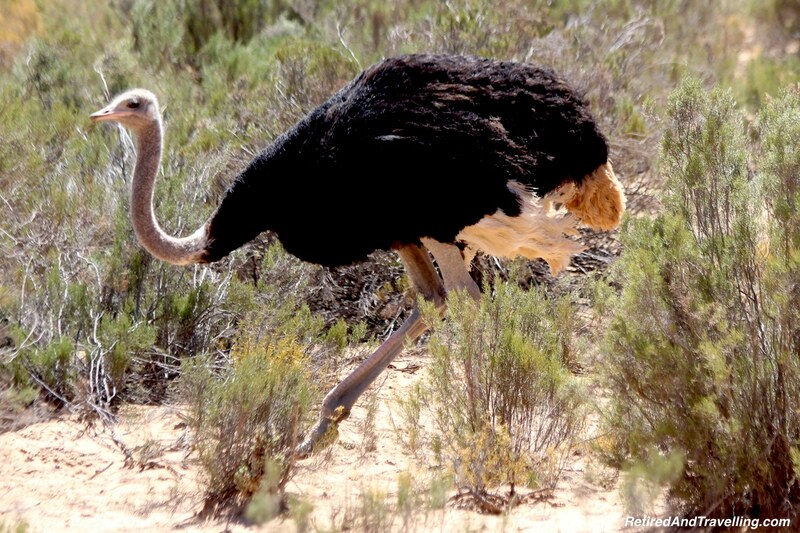 There were also ostriches running wild in the field. Several times we could see them off in the distance and once we even managed to see a male and female one come close. 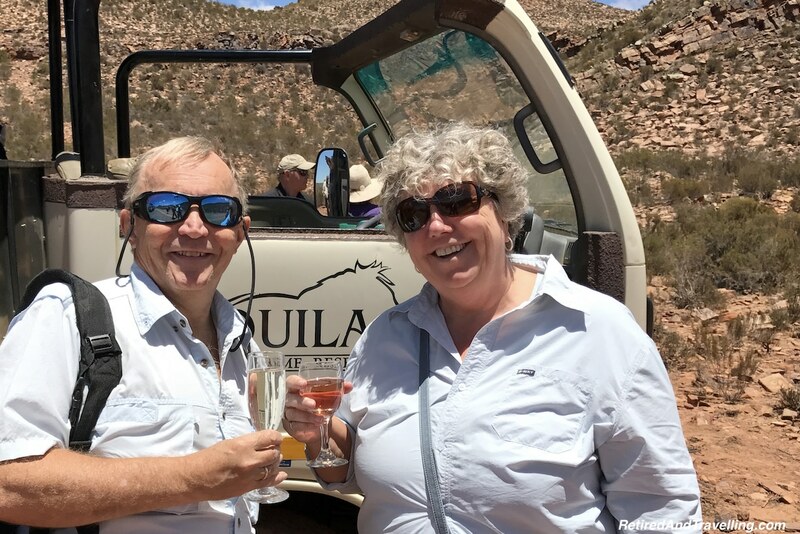 We left the Aquila Private Game Reserve after having seen so many animals. 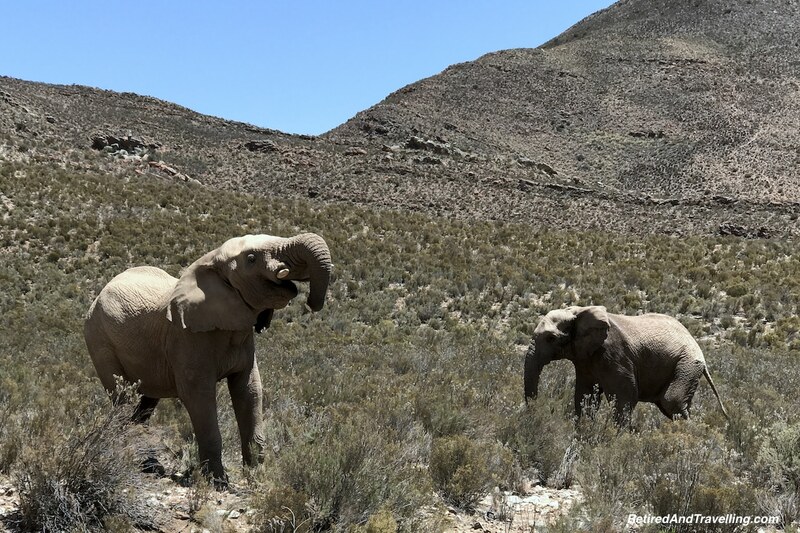 Our game drive from Cape Town was a success! 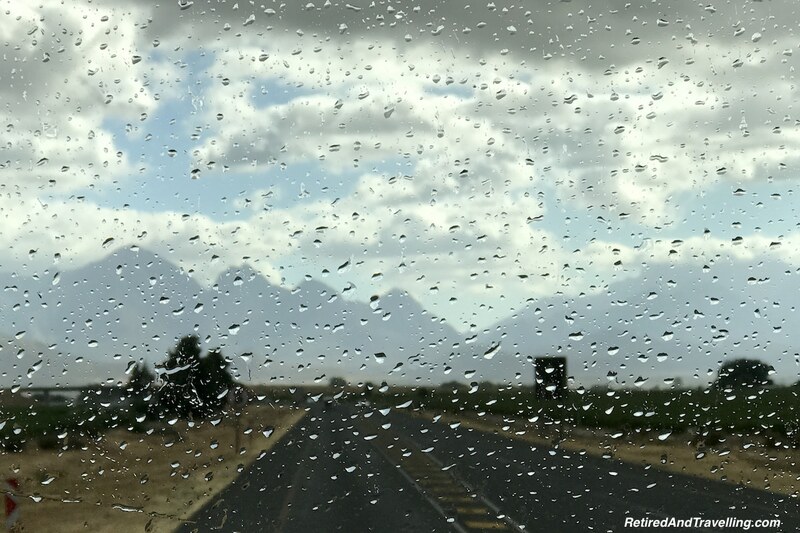 We had drove through a little rain on the way to our game drive from Cape Town to Aquila. As we entered the dry arid areas surrounding the game park, all signs of clouds had disappeared. As we left the game park our driver got a weather update for the pass. Gale force winds were blowing and our trip home would be a wild ride. 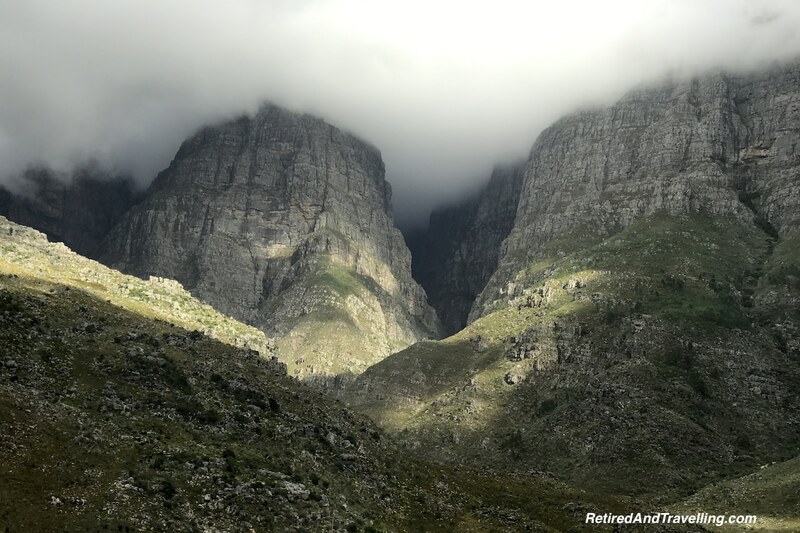 The clouds came in over the mountains and the sky darkened. In the winter, the South Easter winds blow and gust. 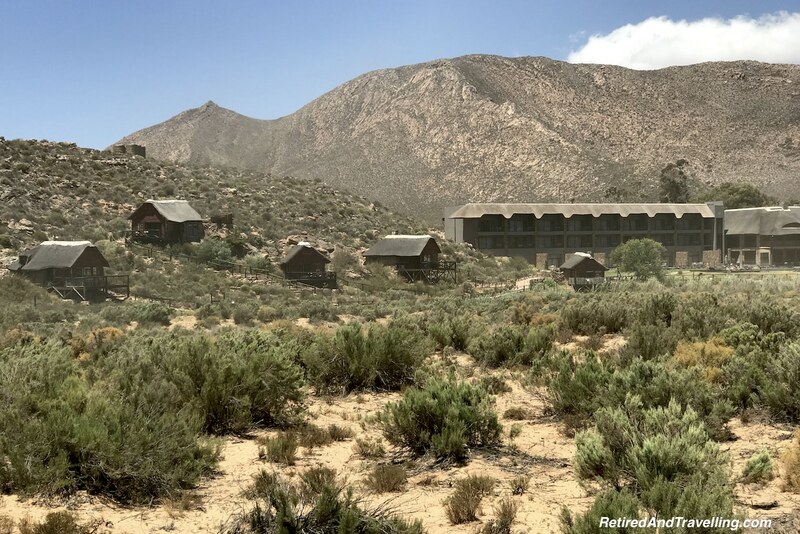 For campers, large trucks and buses the trip through the mountains can be rocky! Our driver took care and got us safely through! 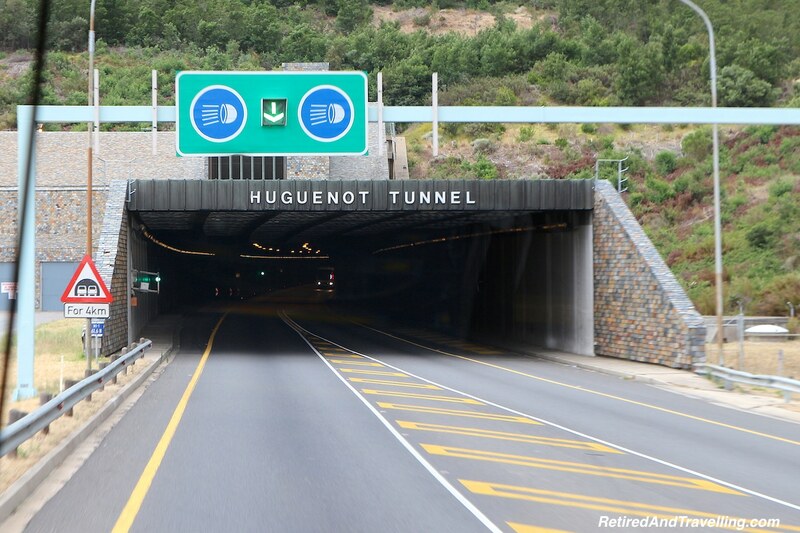 It is a good thing to check the wind conditions before you commit to taking the bridge and tunnel. You may want to consider the old pass road! We started our wild animal adventures in Kenya. 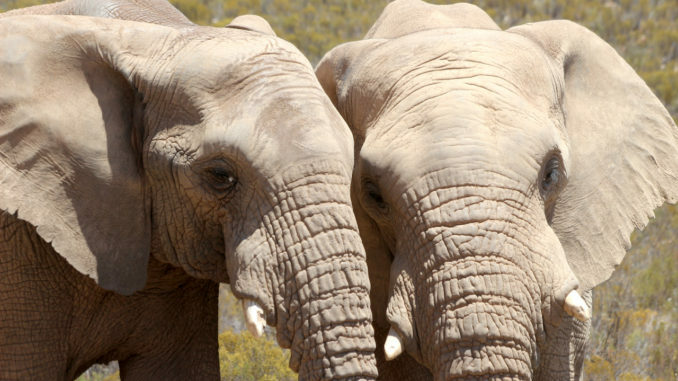 We added to our animal list with a second game drive in South Africa at Richards Bay. 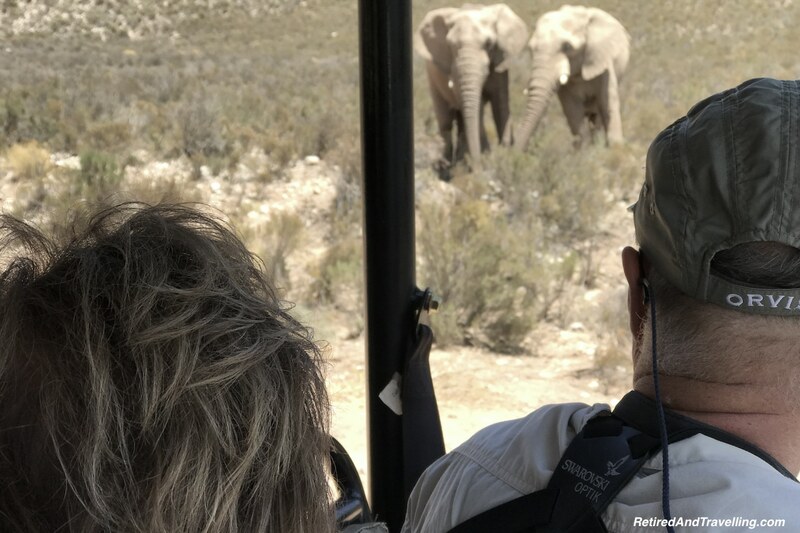 Our final trip for a game drive from Cape Town added even more close up encounters to wild life. On our game drives, we were only in the field for about 3 hours. We went in the middle of the day. So it was probably amazing that we saw as much as we did. Not every jeep group saw the same thing – some got better and some worse. The game drives were a good start to seeing wild animals in Africa. But they were only a tease for us. We knew we would be planning a longer, wilder safari! 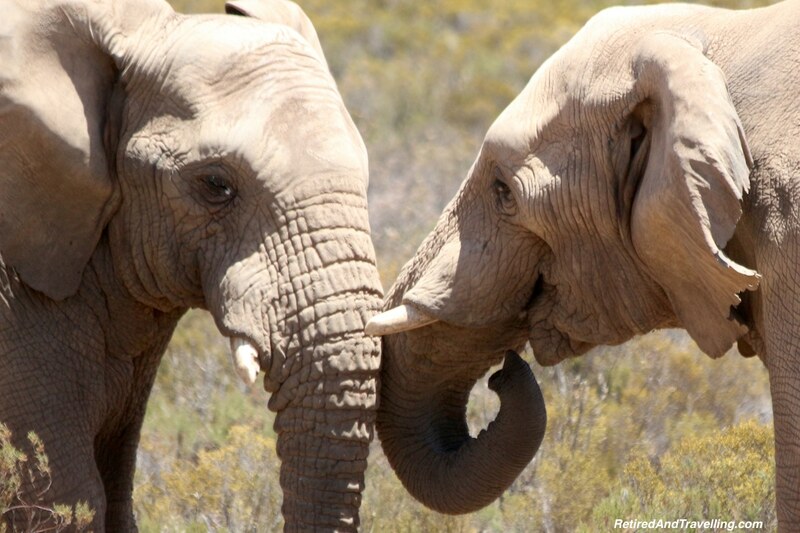 While the game drives gave us larger wild animals, that would not be the only wild life we would see in South Africa. We were swarmed by baboons and I would see my first penguins on our trip to the Cape of Good Hope. 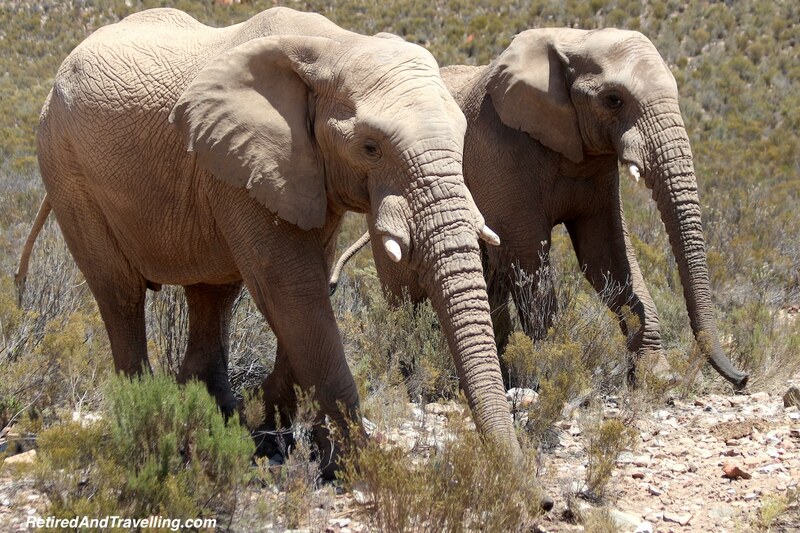 South Africa a great place to visit if you like animal encounters! P.S. 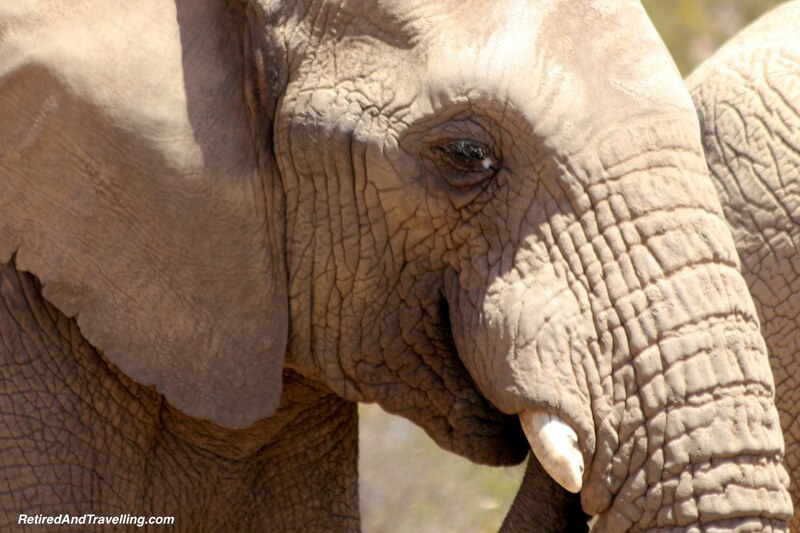 It was hard to pare down all of the great animal pictures that we took on our game drives. If you want to see more animal pictures, click here! 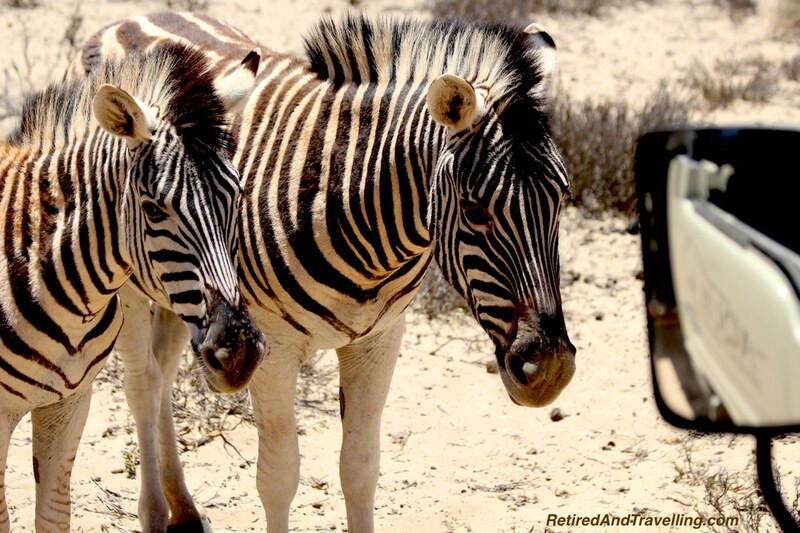 Did you do a game drive from Cape Town? 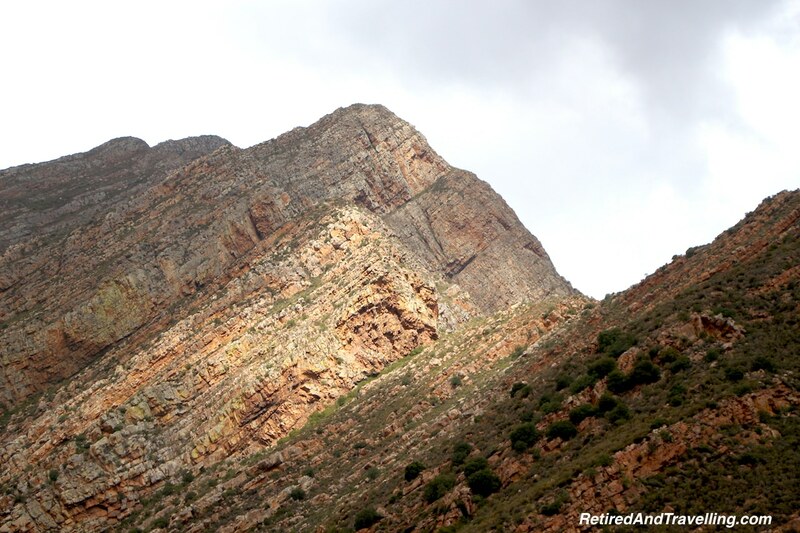 What game reserve did you visit? 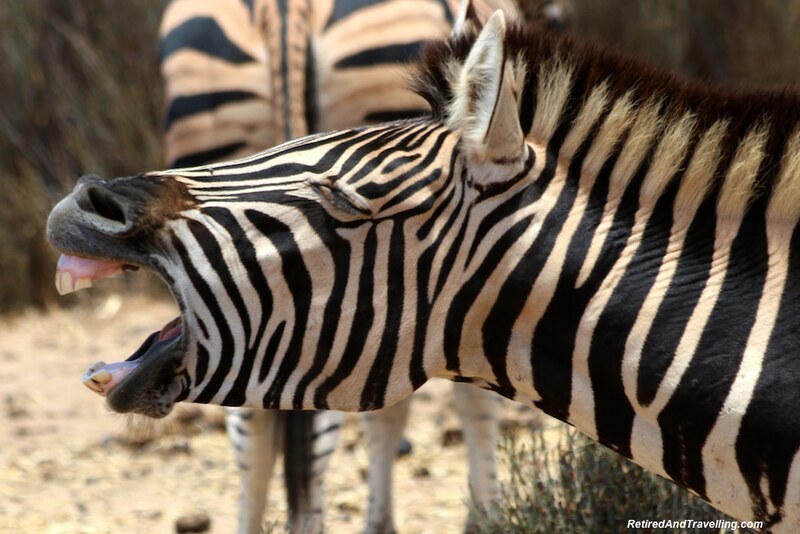 If you have done a game drive, did it whet your appetite for a full safari?